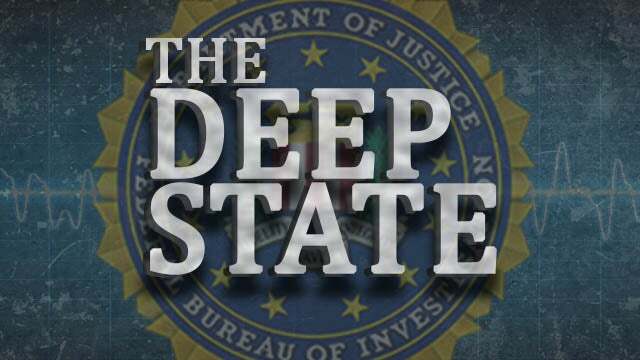 Home Rush The Constitutional Crisis Is the Deep State Coup Against Trump! 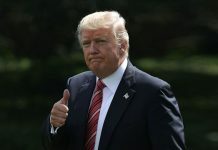 The Constitutional Crisis Is the Deep State Coup Against Trump! RUSH: Over on PMSNBC, a show called Deadline, former Justice Department spokesman Matt Miller — who was he a spokesman for? I’ll tell you, a spokesman for Holder. And Matt Miller, former Justice Department spokesman, PR guy for Eric Holder, said that people should take to the streets over Trump removing Jeff Sessions and appointing Matthew Whitaker as acting attorney general. So this guy Matt Miller was Holder’s spokesman man when Holder was the AG. That gives us a window into the mind-set of a bunch of people on the left. The attorney general’s being fired, being asked to leave. It is perfectly constitutional. And yet the left is running around talking about a constitutional crisis. They still believe that Robert Mueller has evidence that Trump colluded with Russia. And they think that Trump is getting rid of Sessions so that Trump can put somebody in there that is gonna shut this down, so that the truth about Trump stealing the election doesn’t come out. That is what they believe. Mr. Miller said, “This isn’t like all of Trump’s other attempts to interfere with the investigation. He’s reached over and found the one person among dozens of political appointees at the Justice Department who has a preordained hostility, publicly stated hostility to the investigation.” That would be Whitaker, who is the interim attorney general. It’s simply a lie. And the media is gonna repeat that until they think it will convince the public that they’re true. Whitaker has repeatedly stood up for Mueller’s integrity. But they’re out there saying this guy — now, he did question the scope of the investigation and the way it was put together because there’s no crime! The Mueller investigation is bogus on a whole lot of levels. But they don’t want it shut down ’cause they think Mueller’s on the verge of finally get rid of Trump. They think Mueller is really dignified. He could have done this before the midterms and he could have really nailed the Republican Party. But Mueller is a dignified, he’s a true blue great American. He did not want to impact the outcome of an election, but he’s got to — They do think that Mueller has got what they haven’t been able to find. And they think Trump’s gonna shut it down. They think Trump getting rid of Sessions means that it’s only a matter of time before Mueller is fired or shut down. John Brennan, CIA director for Obama, warns that there is a constitutional crisis coming very, very soon because of this. He also was on PMSNBC. He said “the firing of Attorney General Jeff Sessions Wednesday shows the United States may be facing a constitutional crisis ‘very soon. '” You know what the constitutional crisis has been? The constitutional crisis has been the ongoing, approaching now two-year effort at the highest levels of the Department of Justice and the FBI to meddle in the 2016 election. Not the Russians, but James Comey and Peter Strzok and Andrew McCabe and all the rest of those people! Lisa Page, all of the spies they embedded in the Trump campaign. 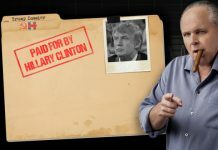 Hillary Clinton paying for the dossier that was then treated as legitimate intel when it wasn’t, to go get a FISA warrant to spy to the Trump campaign! That’s meddling in the 2016 election. That’s trying to keep Trump from winning it. That’s trying to make sure that Hillary won the damn thing. And then after Trump won, the operation continued in an effort to overthrow Trump and get him thrown out of office ’cause they refuse to accept the result of the election. That’s the meddling that’s gone on. The constitutional crisis has been this ongoing, silent coup that is still underway for two years to destroy the candidacy and then the transition and then the presidency of Donald Trump. That’s where the Constitution has been threatened. That’s where the Constitution has been in crisis. 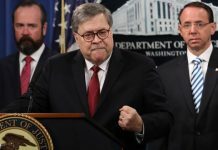 Firing the attorney general is a constitutional crisis? Let me tell you something. Donald Trump would be stupid not to get a wartime team to be able to help him out ’cause they have made no bones what they have planned. Have you heard what was…? There was somebody on the train with Jerry Nadler. He runs one of the committees in the House. They run together, in my mind. But he’s got maybe judiciary. What’s his face, Adam Schiff — Pencil Neck — has the Intelligence Committee and replaces Devin Nunes as the chairman. But Nadler was on the phone on the train; he was overheard. They’re gonna investigate Kavanaugh all over again. They’re gonna go out and find even more women. They’re gonna investigate and impeach Trump. They’re gonna just never stop. The next two years are nothing but never ending investigations. And Jerry Nadler, head of a committee, was overheard talking about this. Trump would be silly not to get prepared for this. (interruption) Judiciary! Judiciary. That’s what it is, the Judiciary Committee. Jerry Nadler from New York. I mean, they’re telegraph what they’re gonna do. Then you’ve got Maxine Waters out there wherever the hell she is promising much the same. RUSH: You know about Jeff Sessions, it’s funny. You remember Eric Holder? Yeah, how about during the confirmation? How about during the confirmation of Sessions as attorney general? 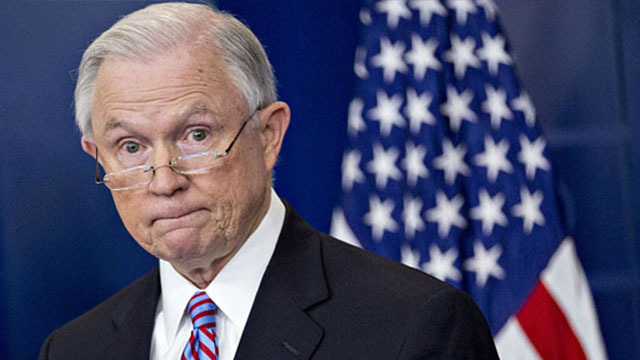 Do you remember all those Democrats telling us that Sessions should not be confirmed because he is a racist? Remember all of the mocking of Sessions because his middle name is Beauregard? I think even Maude Behar was laughing at Sessions because his name was Beauregard. She would say, “We all know what somebody with the middle name ‘Beauregard’ is, don’t we? Ha-ha-ha.” Jefferson Beauregard Sessions! They were making mock jokes about how this guy may well just still be a slave owner — and if he isn’t, he must admire them. He’s a racist. Now all of a sudden, it’s a constitutional crisis if this guy is let go. Now, Holder’s spokesman wants people to riot in the streets because Trump removes him? I mean, even by the left’s hypocritical standards this is pretty nuts. RUSH: Here is Rich. Rich in Chicago. It’s great to have you with us, sir. Hi. CALLER: Mega dittos from the blue curtain. Pleasure to be speaking with you, Rush. RUSH: It’s great to have you, and my condolences, you got that new Pritzker guy as your mayor. You people never get a break there. CALLER: No. No. It’s horrible. CALLER: Who keeps driving on. So my question is, do you think with Sessions out there’s a chance that President Trump would ask Trey Gowdy to be his next attorney general? RUSH: I’ve heard a different rumor. I don’t think it would be Gowdy only because I don’t know how — I’m trying to search my memory bank. There’s something gnawing, something telling me that Gowdy has got some problems with Trump, but I can’t remember why I think that. But the rumor I’ve heard — you ready for this? Lindsey Graham for attorney general to be replaced by Nikki Haley as the senator in South Carolina. That’s a popular rumor that I have — and I have no compunction about spreading the rumor. I have no idea if it’s true or not, but that’s the only rumor I’ve heard about who the next AG might be. RUSH: You like that one? CALLER: I do. I do. But, I mean, I just think with him being embattled, you know, and needing somebody who knows how to fight a war, I would say Trey Gowdy would be the best. RUSH: Why do you think that? Now, there’s no wrong answer, I’m just curious. Why do you think that? RUSH: Right. But what have you seen him do? You’ve seen him chair Republican — he chaired the Benghazi committee. Did he impress you there? Did he get results? CALLER: He impressed me there. He couldn’t get results because, you know, there’s so much gridlock in Washington, in my opinion, anyway. So with not a lot of help he did an awful lot. 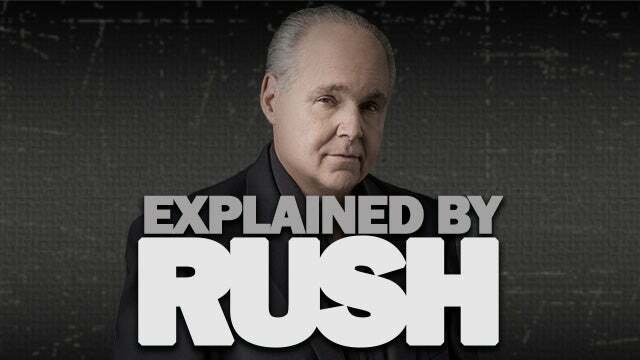 RUSH: Well, I’ll see what I can find out about that. I know that there’s been talk about him as being a potential great attorney general for the reasons that you cite, being a prosecutor. Apparently he was unstoppable as a prosecutor. Apparently he loves it. And supposedly he has been thinking about returning to it. But I’ve not heard his name bandied. By the way, I don’t know what to think of the Lindsey Graham and Nikki Haley thing. Of all people, I’ve never seen Senator Graham as attorney general. Not saying I couldn’t or can’t. It just hadn’t popped up until I heard the rumor. And I always — you know, the Peter principle too. People do great where they are and, “Oh, man we gotta promote ’em.” And you end up leaving a void. Senator Graham has been doing great work in there as a senator since he, uh, since he began to walk the path alone. You know, I hate to mention this, but since the passing of Senator McCain, Senator Graham has been a much more fervent supporter of President Trump. I’m not saying he never has been, but he was deferential to Senator McCain for a while, but since McCain’s passing, Senator Graham has been — well, he’s been excellent. And I would hate to lose that kind of energy and willingness to use it in the Senate.